World famous cubist sculptor Jacques Lipchitz (1891–1973) was born in August some 127 years ago in Druskininkai. This August, one of the most famous works by Lipchitz from the Museum’s collection is presented here as the exhibit of the month. 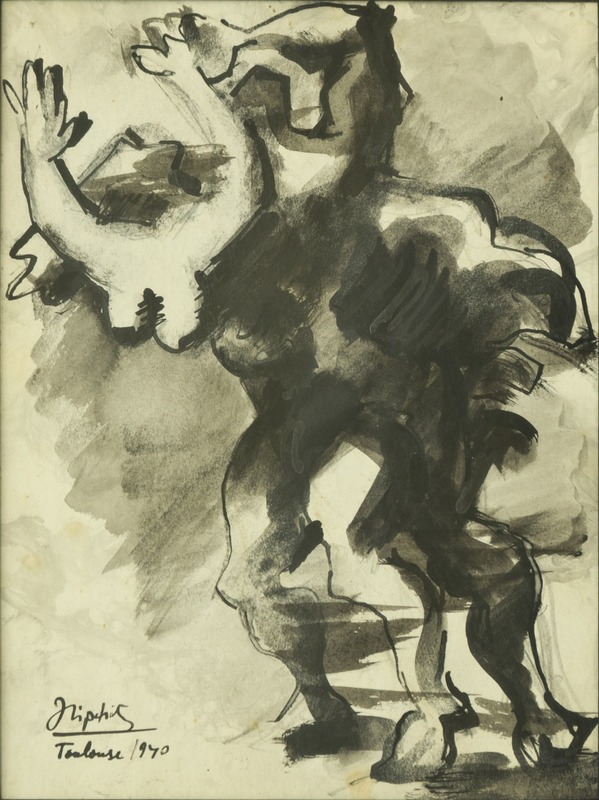 In summer 1940, Lipchitz started drawing sketches for his sculpture The Escape which is considered to be his last work from the Paris period before leaving for the USA. The majority of his famous works from this particular period were created in his studio in Paris, in the Forest of Boulogne, which was designed by the sculptor’s friend Le Corbusier. However, The Escape was created in Toulouse, because the moment the Germans entered Paris, the sculptor and his first wife Berta abandoned all their activities in Paris and hastily left for Toulouse leaving a unique collection of works behind, including the studio, which the sculptor entrusted to his friends. Supposedly, the sculpture was inspired by the baroque masterpiece of Gian Lorenzo Bernini Apollo and Daphne. The drawing The Escape portrays two figures – a man and a woman – in desperate movement. The woman’s hands are stretched upward as if begging, with her head drawn to one side in despair or horror. The silhouette of the man firmly holding the woman or supporting the female figure who is leaning against him causes a two-fold impression – that of a saviour and an aggressor. Lipchitz created The Escape as if anticipating the approaching doom. With a passport which was about to expire, the sculptor and his wife had to hastily leave Toulouse for Portugal. From Portugal they took a ship, crammed with people, across the Atlantic to the USA. Lipchitz slipped on a ladder on the ship and almost drowned. This experience haunted the artist who finally reached a safe haven in the USA for many years to come. He created a series of sketches depicting some ideas for his future sculptures, such as The Escape and The Road to Exile. Some sketches depict people carrying other human beings on their back. The escapees may have already reached a safe haven, but the hard road to exile is still ahead of them. Yet other sketches depict a desperately screaming figure carrying a man who is on fire. This is an allusion to the fact that not all of the escapees had safely reached the port of destination. In 2016, the Museum of Jewish Art and History in Paris attributed the sculpture The Escape,which is based on this drawing, to the five most significant exhibits of the museum.